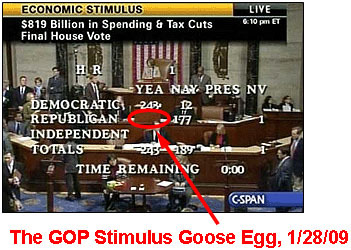 Should we pass a second stimulus? A growing chorus of economists say yes. They’re afraid that the mini-recovery we’re seeing right now is going to stall soon, leading to a second recession. Consumer and business demand just isn’t up to the task of keeping the economy growing, so government demand will have to step in. Olivier Blanchard, chief economist at the International Monetary Fund, may have cracked the code on to boost the economy and not spook bond investors and budget hawks. Blanchard’s grand bargain, one I have been suggesting for months, is for government to spend more money in the short term to boost growth while simultaneously taking strong action to reduce the long-term budget deficit. “The trade-off is fairly attractive,” Blanchard said in a report this week. “IMF estimates suggest that the fiscal cost of future increases in entitlements is 10 times the fiscal cost of the crisis. ….As an analysis I commissioned from the American Enterprise Institute revealed, extending the Social Security retirement age while at the same time indexing benefits to inflation rather than wages would turn a $5 trillion present value deficit into a $5 trillion surplus. In principle, this isn’t crazy. By credibly phasing in entitlement reductions, we could spend more money now without setting off debt alarm bells down the road. And you wouldn’t have to go as far as Pethokoukis either. You could finance a trillion dollar stimulus package with only a tiny change in Social Security or Medicare growth. The problem, of course, comes from Pethokoukis’s specialty: “the nexus of Washington and Wall Street.” It’s true that Republicans would normally be in favor of entitlement cuts, even if they were fairly small. But they aren’t in favor of stimulus packages and they really, really aren’t in favor of doing anything to support the Obama administration. So in real life, if Democrats proposed some kind of bargain like this, they’d instantly do exactly what they’re doing right now with health care: begin screaming about rationing (if the cuts were to Medicare) or selling out the elderly (if the cuts were to Social Security). They’re the Party of No, it seems to be working pretty well for them, and there’s no reason to think they’re willing to give that up in order to help the president rescue the economy. So this seems like a political nonstarter, even if technically it might have potential. Until someone explains how to get Republicans to grow up and get on board with this, it’s not going anywhere.